A resource for other musicians appearing on Todd's albums and in tour bands. 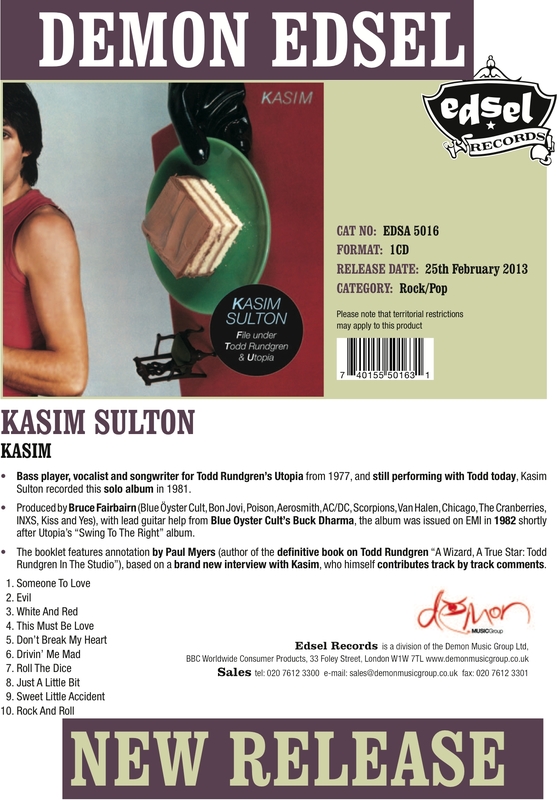 Kasim's 1982 solo debut has been re-released with new liner notes by Paul Myers and track annotations by Kasim. It's available from the Amazon UK site for only £8. View the info sheet by clicking on the image at the right. David Kulczyk, who interviewed Todd about "Liars" also did this August 2001 interview with Kasim. 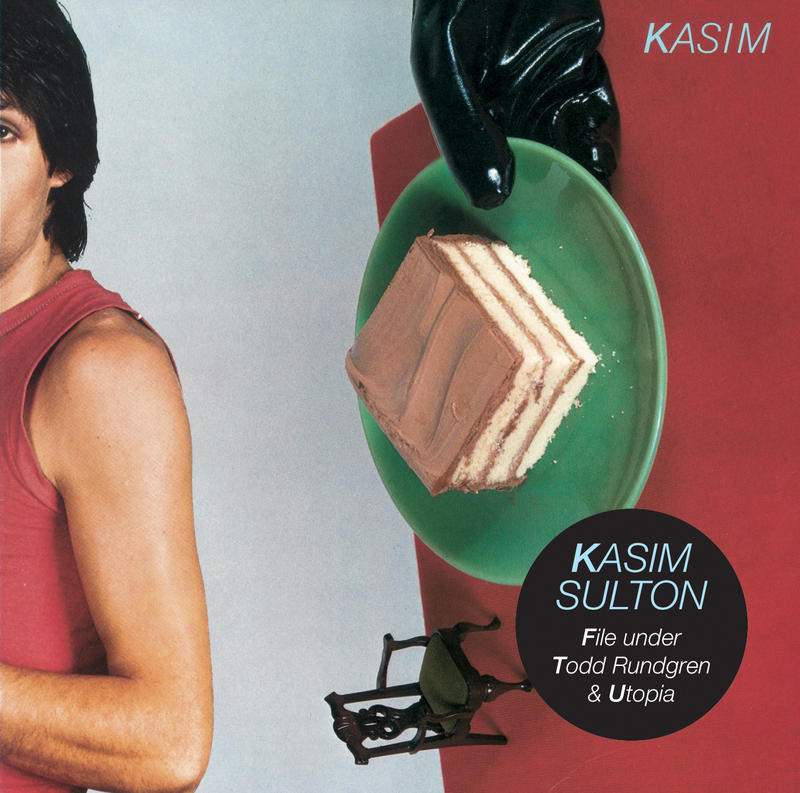 Kasim's New official site, KasimSulton.com, is now open. A new Kasim interview is available from Highwire Daze. Kasim sings lead and plays bass on two tracks on the new CD from Pushing Red Buttons available from TRBazaar.com. SAN FRANCISCO - Roger Powell releases Blue Note Ridge, a collection of improvisations that embrace classical melody, contemporary harmony and impressionist forms on this debut solo piano album. A stream of consciousness merging styles and eras, Blue Note Ridge is pure, elegant and honest. In the 70's and 80's Roger Powell's groundbreaking electronic synthesizer albums Cosmic Furnace (Atlantic) and Air Pocket (Bearsville) were hailed as masterworks. Powell has always been held in high esteem by his peers. "Even among the keyboard titans of the prog-rock Seventies, Roger Powell always stood out." (Future Music U.S. Ed.- June 2006). 2006 signaled a welcome return of Roger Powell with the retro-futuristic, groove oriented, Fossil Poets (Inner Knot CD/Vinyl LP). The critically acclaimed release was produced by award winning producer Gary Tanin, who along with Powell, produced the 2009 solo piano offering Blue Note Ridge. Fossil Poet Records is releasing Blue Note Ridge as a Limited Edition CD through CDBaby as well as digital download by way of iTunes, Rhapsody, Napster, and Mindawn (offering a cutting-edge lossless format for superior audio fidelity). In support of all the great press and airplay Fossil Poets has been receiving a new e-card sales promotion is beginning today. We've made it easier than ever to get copies of Roger Powell's - Fossil Poets in CD or Limited Ed. Clear Blue Vinyl LP. There are even a few autographed vinyl copies still available! Roger Powell's new collaboration Fossil Poets came out in Fall 2006. A feature article on the project can be found at OnMilwaukee.com Roger Powell Returns! is a new extensive interview from "Electronic Musician" on the "Fossil Poets" project. Last night, Moogy Klingman, longtime friend and Utopian passed away after a difficult battle with cancer. He will be greatly missed. RIP Moogy. Former Utopia keyboardist Ralph Shuckett has had a long musical career, beginning before his stint with Utopia (a group called Jo Mama), and continuing as a soundtrack composer in Pokémon: the First Movie. Former Utopia bassist John Siegler came out of a group called "Air" and has most recently been involved in musical scoring with a co-credit on the Pokémon theme. Former Utopia synthesist "M. Frog" Labat released a couple of post-Utopia solo albums plus did some session work with John Holbrook (AKA Brian Briggs). He's reportedly in France, recording church organs in the great cathedrals of Europe. Michele Rundgren - Michele is Todd's wife, but she has long been a backup singer and dancer for many of Todd tours, dating back to the A Cappella tour. Michele kicked off her standup comedy career and has her web site at http://www.michelerundgren.com/. An online interview with Michele debuted September 26, 2007. Michele's comedy tour is about to get underway. For the latest on her tour dates, see http://www.michelerundgren.com/tour.htm. Michele debuted two tracks from Todd's Liars CD on her weekly radio show broadcast 2/13/2004. The tracks were "Happy Anniversary" and "Soul Brother." Many know of connections with David Bowie and Tin Machine, but did you know about their pre-Runt foray with Tony and the Tigers? Jesse is interviewed for the Artist Connection podcast. Stewkey collaborated with Otto Capobianco to form "Crazy." Their five-song CD features a remake of "Hello It's Me." It can be ordered for $7 + S&H. Call (215) 742-8412 or email grnsinger@aol.com for ordering info. John Ferenzik (the Individualist, With A Twist) John's got his own site now at http://www.ferenzik.com and a great new CD - "House of Boris." A recent interview with John Ferenzik is on Mizar 5. Larry Tagg - Larry Tagg (Nearly Human, the Individualist tour, Bourgeois Tagg) has a new web site focusing on his Civil War writings. Lyle Workman (Nearly Human and 2nd Wind as well as Bourgeois Tagg) has a new web site as well as a new CD Tabula Rose. Trey Sabatelli toured with Todd as part of the Power Trio Tour in 2000. Trey is also a member of the Tubes.